We also got our bus tickets for Almaty. Due to our visas being double entry we were going to have to head to Kazakhstan in order to use the second thirty days we were allowed. The bus it turned out was supposed to leave at 19:00 and arrive the next day in Almaty at the same time. Sadly the journey did not go to plan and while we left on time we arrive some eight hours late. This was due in main to the Kazakh border which was an absolute nightmare. Going from China to Kazakhstan was like leaving civilisation in some regards. 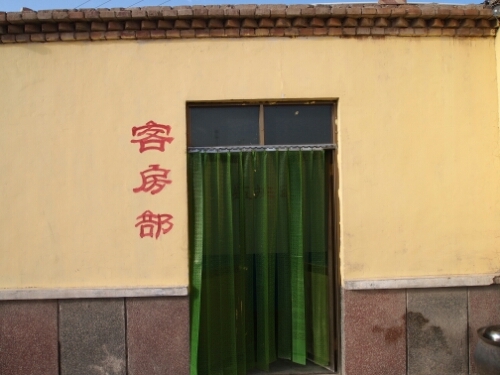 The Chinese border had had orderly queues and quick efficient processing – the Kazakh one had pushing and arguments and waiting times that stretched on and on. Then we hit the road and it hit back, so we ended up bouncing most of the way from the border to Almaty. I wished I had my bike at the border as in the past I had been waved to the front quite often when I was with it, now I was just another disregarded foot passenger. One plus of the journey was the incredible road the Chinese had built part of the way through the mountains. There was a massive suspension bridge between two peaks and another stretch raised high above a gorge on giant concrete stands. Not to mention the tunnel that seemed to curl up and round through another mountain. There was also a beautiful mountain lake surrounded by peaks. Arriving in Almaty was again back to civilisation as it is a modern city for the region. We were able to go the cinema in English and have a couple of days rest before embarking on the return journey. Thankfully the bus back was a lot quicker than the bus out and the journey only took the 20 hours as the Kazakh border was a lot less busy. Sadly from Urumqi, Meka and I had decided to continue on separately. Meka wanted to make sure she could see the east of China without having to worry about renewing her visa while I wanted to try and cycle the whole way. I have the option of getting a train to Hong Kong and getting a totally new visa if I have troubles renewing mine, which Meka, who needs a separate visa to visit Hong Kong does not. So I would be riding off out of Urumqi as soon as possible while Meka would be getting a train to the city of Xi’an from whence she would try and ride to Beijing and then Shanghai. Leaving Urumqi was thus very difficult as Meka and I had been travelling together for a while now and it had been a lot better than riding solo in many ways. Off I went out of Urumqi and made it at least 10km out of the city before the wind kicked in and I was struggling to get above a crawl Dust was swirling round me and the wind pushing me back as I worked my way up and over the hills surrounding the city and onto the roads towards the east. The only plus concerning the wind was that it kept me cool in the baking heat. The wind was clearly a regular occurrence as there were huge wind farms lining the road and off into the distance as well. Apparently China has been making huge efforts in renewable energy in recent years. So much so that at one point they were building wind farms too fast for the grid to take the energy. 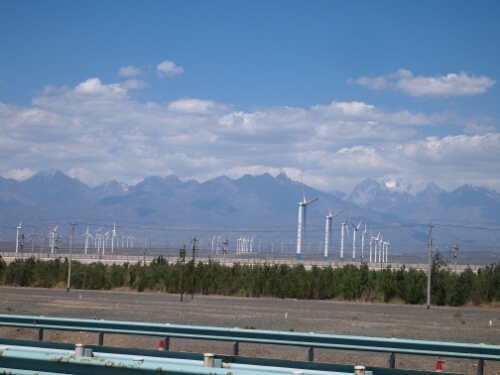 In the end the first day out of Urumqi was a really tough one, my legs started aching early on after the strain of pushing against the wind and quite a few times I contemplated turning around and taking the train withe Meka. 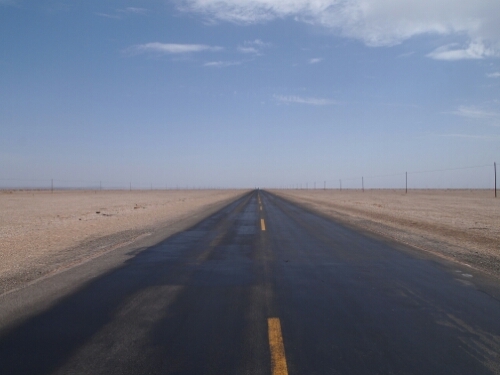 In the end I was lucky to reach the gradual descent into the Turpan depression that let me freewheel for long periods. 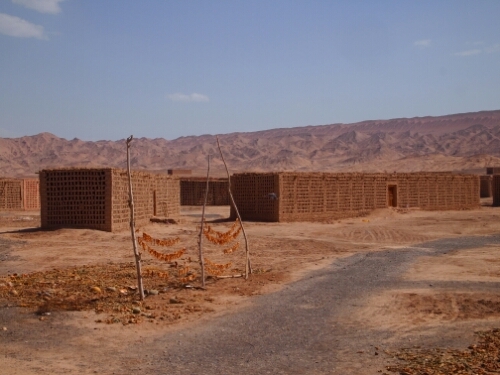 The town I was riding towards: Turpan sits in a depression that has the lowest point in China and the third lowest point of land in the world. Thankfully I arrived that day and managed to enter in the evening as it was cooling off somewhat. The town also had a youth hostel so I had somewhere cheap to stay without worrying about police action or baking in the desert in my tent. The next morning as I was getting ready to leave I was approached by a Chinese guy who was staying at the hostel too. It turned out he was cycling as well and was going in the same direction as me. Next he indicated that he wanted to ride with me and that he would get ready to leave as well. I was happy to agree as it would be nice to ride with someone else and it would be good to see how a local toured. So we got ready and Xiao and I headed off into the heat with about ten shared words in our two languages. It didn’t take long to make me glad that I had invested in decent tyres on this trip as after about 10km we had to pull into a petrol station for Xiao to fix a flat. This was clearly something he was used to as he made the repair with a speed and facility I could only dream of emulating. After our brief pause we continued on. On into the heat. It was baking even at what passed for 8am in that area, so hot that I didn’t even seem to be sweating as it must have been evaporating too fast. On our first break we stopped at a petrol station where Xiao was kind enough to buy a watermelon for us both to eat. Unfortunately I really don’t like melon so had to soldier through half a huge one in order to be polite. At our next stop we pulled up by a small stream flowing down a small side road parallel to the highway we were riding on. Here we soaked our feet and whatever items of clothing we could in water to help keep us cool. Xiao then called a friend of his who spoke English so she could explain that we should stop there for a couple of hours as it was the hottest part of the day now. I didn’t want to argue so agreed and got to spend a nice relaxing time by the side of the stream. Some nearby locals brought us out a rug to lie on and some grapes to eat which we were very grateful for. The melon sellers were also selling raisins and I think that they were drying them in large buildings made with regular holes throughout their walls. At least that is what I think I determined via sign language. 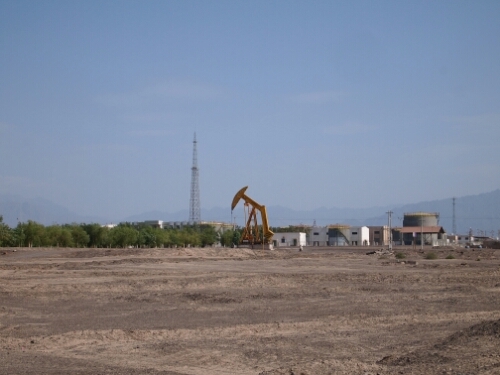 There were also oil rigs off through the desert, showing that China is still interested in more traditional energy methods as well. 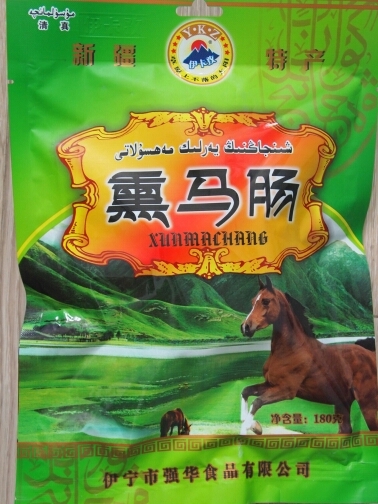 Originally I had planned on riding with Xiao as far as the town of Shanshan about a hundred kilometres from Turpan and then continuing on my way myself. As we approached the town though a wind struck up and suddenly we were struggling to get anyway and were in the midst of a small sandstorm. This was not the end to the day I had pictured and it drew out the last of my energy and so I decided to just keep tagging along with Xiao and see if there was somewhere I could stay in town. Luckily Xiao seemed to assume that I was going with him anyway so didn’t seem surprised when I continued to follow. Eventually we met with some friends of his who appeared to either own a hotel or know the owners. Anyway, we ended up in a nice enough room and were able to get showers before heading into another room in the building. This seemed to be set up for some sort of calligraphy club and we were given some very small cups of tea and next I know I am having my photo taken with a bunch of people. From a bunch of different cameras: hence the half closed eyes in the above. Thankfully this didn’t go on for long and Xiao’s friends kindly took us off for something to eat and then let us get some rest. Xiao it turns out is riding round China for some reason to do with promoting Chinese traditional calligraphy. If you can read Chinese you can read his blog and find out the real story: http://www.xiaohaipeng.com. The next morning I woke up feeling tired and very very saddle sore. I’d been wearing new shorts the last couple of days and they really hadn’t helped. Originally I had planned on continuing riding that day but when Xiao said he was having a rest day I figured I would join him. We hung out in the hotel most of the morning and afternoon to avoid the heat. Xiao devoured another melon or two and I decided if we were going to ride together anymore I was going to have to start politely refusing melon instead of politely eating it. Also I was not sure how Xiao seemed to survive on what appeared to be a melon diet…they’re mainly water aren’t they? That afternoon we headed off for some sightseeing. We were going to see the Kumtag desert. I didn’t know what to expect as I thought we had been riding in the desert anyway. Also we were going to walk there which seemed strange as it was still very hot and surely the desert proper was a long way away. 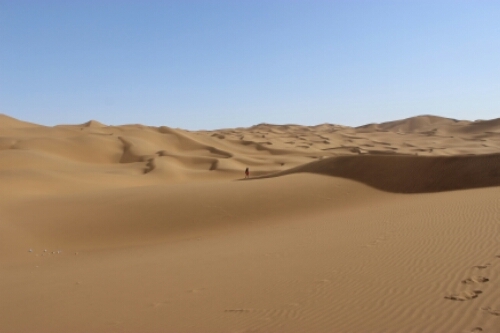 Thankfully I was wrong and the Kumtag desert is described as being the desert closest to a city in the world as it has a distance of zero to Shanshan. This was true as well, you wandered out of the town and bang you were at the desert national park. 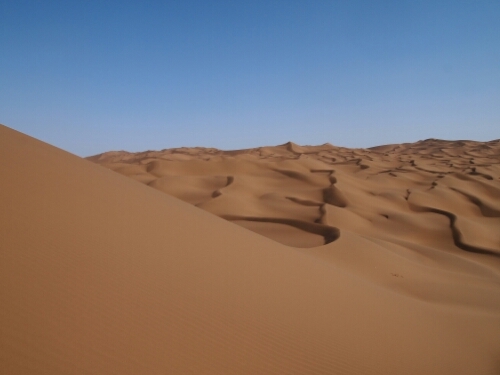 It was clear why this was considered desert worth seeing as well. There were sand dunes and camels and the trappings to make you think you were really in the desert proper. It was very beautiful and of course like everything outside for the past few days very very hot. After we’d finished wandering around desert park we headed back into town towards our hotel. Unfortunately we were spotted by police before we made it. They called us over chatted with Xiao and checked our IDs then drove off. I thought that maybe with a Chinese guy to explain I wasn’t going to have to worry about registration. In my heart I knew we had gotten off too lightly and that that wasn’t the end of it. I was right, about five minutes later they stopped us and called us into their van to be driven to the police station. The upshot being that Xiao used his phone translation app to tell me that I couldn’t stay in the hotel we were in; the outcome I had been expecting. Xiao then started working on a solution and we checked at another hotel who directed us to another I could stay in. We had something to eat in the meantime and at this point I felt pretty low. I was still feeling tired and I just wanted to go back to where we were staying apply cream to my saddle sore backside and sleep on my front till the morning. Instead I was going to have to find somewhere else to stay. 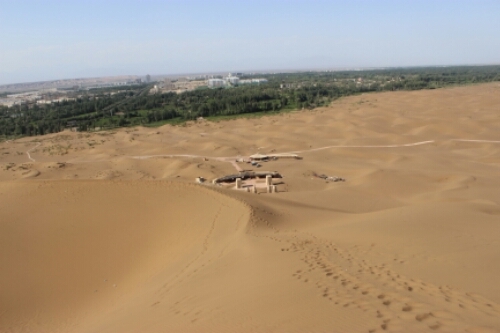 I had learnt earlier from Xiao that he was planning on taking the train from near here to the station near Dunhuang (the next tourist stop of any note) about 600km away. So I thought about it and signed to him that I would come with him on the train tomorrow. I knew that the next 600km would be mostly empty barren desert with temperatures rising above 40 degrees and if they weren’t that high it would be because there was a strong headwind blowing you to a stop while cooling you at the same time. I was definitely not in the mood for this and to be frank I was fed up of riding on desert roads. So I planned to take that train and save some of my visa time for the interesting sights that would come further on the road. After dinner we headed off to find the other hotel and as we did so we encountered another Chinese touring cyclist. The next thing I know I’m in a new hotel with a new roommate who had gone on ahead to arrange everything while Xiao and I packed up my stuff. After a brief night’s rest I woke up at 5:30am the next morning to ride the 40km to the town’s train station…a bit further than I had envisaged. At 6:15 I went back to sleep for an hour as Xiao couldn’t get out of his hotel so early as the doors were still locked and no one around. Eventually we headed off and the 40km gave me a chance to reflect on my decision and change my mind if I wanted. When we got to the turning for station or the highway after about 20km I carried on with Xiao I really couldn’t see any point to punishing myself in the desert and was enjoying riding with my new Chinese friend as well – even if we didn’t really have much idea what the other was going on about. Also be seemed to be putting up with me OK. Taking the train was an experience in itself. I had to take my bike apart as if for flying and put it and my bags through security scanners. I then had to carry the disassembled bike and my six bags across a couple of platforms. This was not easy as it is hard enough moving it around when it was loaded. To cap it off I had to run down the platform when the train arrived as our carriage was at the end. This took two trips and a lot of shouting from the Chinese train staff to hurry. Eventually everything was on the train and next Xiao had to negotiate some somewhere to keep everything with the conductors. I think we should have sent our bikes as freight separately or something. In the end we were able to put them in the vestibule between the final cargo carriage and the passenger carriage we had our seats in. Bikes and luggage stowed we were able to find our seats and relax. After about twenty seconds it seemed like I had half the carriage leaning around my chair to see what I was. Thankfully after about five minutes they realised I probably wasn’t going to do anything crazy and foreign and stopped staring, though those in the seats around me would soon start up again if I made any sudden moves or looked to closely at anything in my bag. The train journey was great – six hours of air conditioned comfort. I got to watch a film, read my book and take a nap. I also took note of the scenery or lack of it as we passed, especially when the external temperature flashed up at 46 degrees and didn’t regret a kilometre! Arriving at the station we assembled our bikes in front of a small audience and rode off to find somewhere to stay. 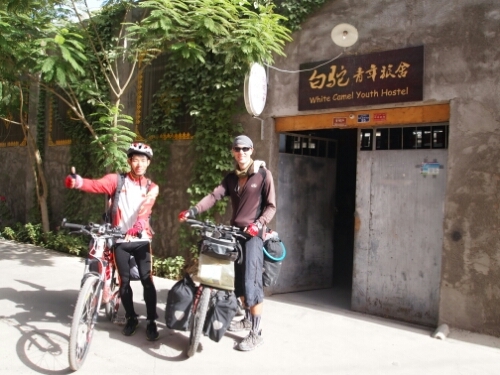 We managed to find a very cheap hotel after Xiao conferred with another cyclist going the other way. This was a hotel you definitely needed to know Chinese to stay at as there was no indication it was a place to stay other than a few Chinese characters next to a nondescript door. Inside it was fine and we managed to get a good night’s rest miraculously undisturbed by the police. The more I rode with Xiao the more I realised we had very different things in our bags. Xiao for instance seemed to carry no food with him. I had food for about three full days, just in case. As well as snacks, still he would never starve where melons were sold. Also he had quite a few items that I and I imagine most European cyclists wouldn’t carry. This included, most spectacularly, a hair dryer as well as a full on metal flag pole that didn’t double as anything clever like a tent pole as well. He was also carrying a huge old laptop and more charging equipment and wires than seemed necessary. This didn’t seem to slow him down and he made good time on his battered Merida which really needed some work. Even on a short ride I could tell his headset was misaligned so his handlebars weren’t straight for instance! The next day we rode for Dunhuang, which was still 133km away from the station we had stopped at. About five minutes into riding Xiao unfortunately had his second puncture of our ride together, two in about 130km did not bode well and as I checked his tyres I tried to mime he needed new ones as they were as bald as an egg. Luckily the ride was mostly a very gradual downhill of 1% or flat with little wind. This meant we made incredibly good time and I didn’t aggravate my saddle sore too much. We thus rolled into Dunhuang in the early evening and found a hostel to stay at and prepared to see the sights of the morrow.